3. URL of spoof website disguised as " Complete Account Verification Info "
5. Website traced to Vienna, Austria. "Due to recent activity, we will suspend any activity on your account in order to allow us to investigate this matter further." After responding to the message, we ask that you allow at least 24 hours for the case to be investigated. Emailing us before that time will result in delays. We apologize in advance for any inconvenience this may cause you and we would like to thank you for your cooperation as we review this matter. If you received this notice and you are not the authorized account holder, please be aware that it is in violation of Regions Bank policy to represent oneself as another Regions Bank user. 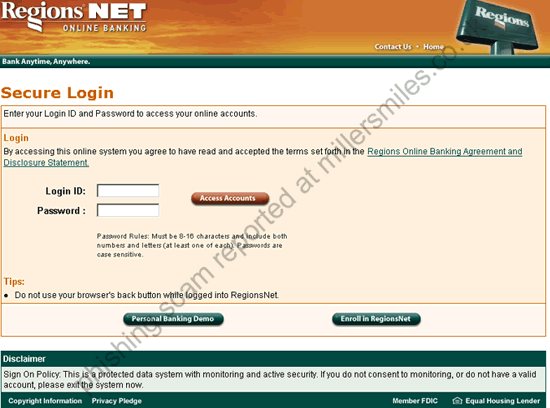 Such action may also be in violation of local, national, and/or international law.Regions Bank is committed to assist law enforcement with any inquires related to attempts to misappropriate personal information with the intent to commit fraud or theft. Information will be provided at the request of law enforcement agencies to ensure that perpetrators are prosecuted to the fullest extent of the law.